The Entertainment book, a huge bastion of coupons which we probably will never end up using. I mean look through the darn thing, some places in there are offering 2-for-1 and we still try to avoid them like the H1N1. Actually, I'm sure some would prefer the H1N1. After all, in both instances, you might end up praying to the porcelain god. Now since I've bestowed you with such a lovely thought, lets move on. Hidden in the multitude of useless coupons, there resides some real gems. For example, The Cannery (closing in March) is one of those coupons I look for every year. 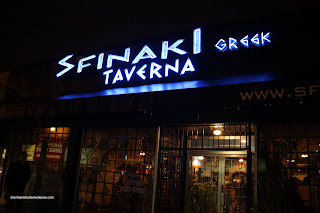 Searching through the book tonight, I happen to spot Sfinika in Burnaby North. 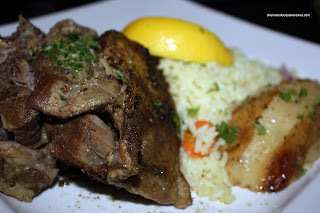 I did a quick look at Urbanspoon and Dinehere for some info on the place. Hmm... Seems like a solid place. With a poorly ripped out coupon in one hand and grumblings from my stomach, I called up Wolvie and made sure she brought her coupon as well. Yup, we had 4 of us tonight and we used 2 coupons. That made for some affordable eats. Of course I never actually end up saving any money since I end up ordering more to compensate for the discount. Normally, with Greek food, it can be quite heavy and there is really no need to get a big appy. In fact, we normally share one Calamari and we're good. Well, me and my "stomach is bigger than my pants" rule came into play. I ordered the biggest, most expensive appy on the menu - the Appetizer Sampler. 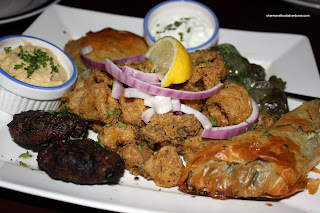 Included in this platter were Keftedes, Spanakopita, Dolmathes, Kalamari, Pita Bread, Tzatziki and Humus. Honestly, all of it was pretty good. The Keftedes (Greek-style meatballs) were browned up nicely and had a strong onion flavour. Despite what some people think, I do not hate onions. In fact, in this case, I really liked the flavour. It's the consequ ences of eating onions which is the problem... (TMI!!!) Crispy and light (well, at least the phyllo), the Spanakopita was stuffed with the usual feta and spinach. 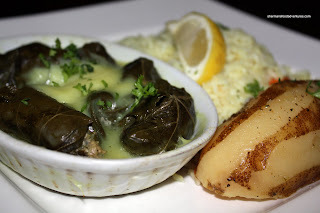 The Dolmathes were not wrapped too tightly and I prefer it that way. The rice and meat were soft as a result. The Kalamari was also very good with a nice crunch and easy to eat texture. The only thing we wished for was a bit more zing in the Tzatziki. 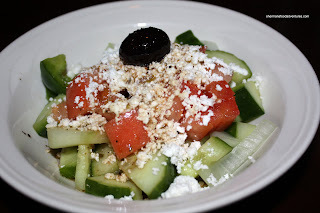 We all started with a Greek Salad and this one was pretty good. The cucumbers and tomatoes were fresh and colourful with plenty of zing from the dressing. For my main, I once again went with the Roast Lamb. Hey, I love lamb! It was pretty tender in most spots except where the meat had less fat. Not much you can do about that really. It was well-seasoned with plenty of garlic flavour. I absolutely loved the texture of the roast potato. It was cooked all the way through without being mushy. Although I would've preferred a lemon potato instead. I have to say the rice was a complete miss. There was quite a bit of moisture and was bordering on soggy. Wolvie went for the Beef and Chicken Souvlaki. She smartly asked for it to be plated without the skewers. This way, you won't have rogue piece flung across the room while trying to remove it. These little morsels were well-seasoned with discernible garlic and oregano notes. Naturally, the chicken was more tender than the beef; although by no means was the beef tough. Viv decided to depart from the usual and order a random dish. 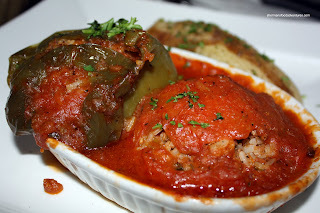 She chose the Yemista, which is a baked tomato and pepper stuffed with beef, rice and tomato sauce. Call it a personal preference; but we thought it was only okay. Not that it was offensive in any way, it just wasn't all that interesting, to us anyways. Everything just seemed a bit mushy and tasting like tomato. Not being interesting at all, Italian Stallion had more Dolmathes, except his were bathed in a simple lemon dill sauce. We all enjoyed our food at Sfinika. 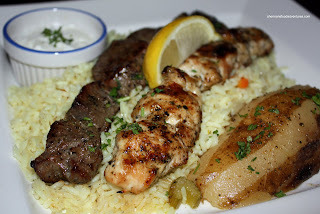 Nothing mind-blowing; but solid Greek food nonetheless. The service was friendly and the Entertainment coupons were a bonus. However, without the coupons, the prices are a bit on the higher side. Freaky! We randomly passed there with a craving for Greek today and I come home to see your post. That is indeed freaky. Wait til it happens again! wow, the yemista looks kind of disgusting. :) reminds me of something i shouldn't mention. hehe... i know what you mean about the entertainment book... most of those coupons are horrible. i always steal the one for me n' eds pizza from my mother's book. and what's up with lack of perforation? makes for messy coupons each time!